Each tweet sets off a series of lightening that roars through the clouds mimicking a vicious thunderstorm. 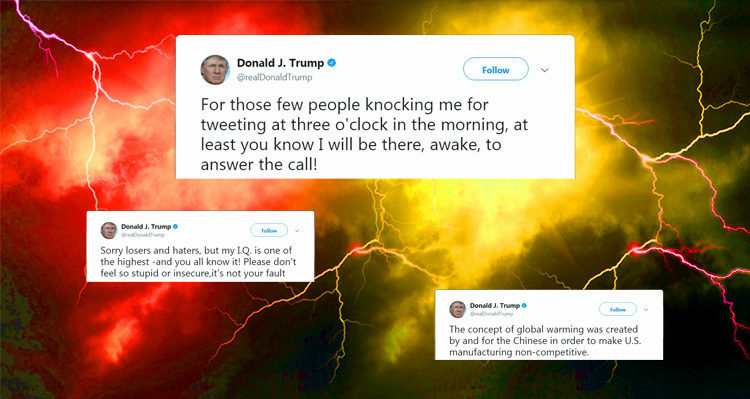 French artist Parse/Error has come up with a great way to respond to Trump’s incessant need to Tweet insane gibberish at all hours of the day and night. I am a French artist, based in Marseille. Self-taught, my work is born of the encounter between art, design and technology. I explore the relationships between humans and their environment, seeking to provoke questions and sensations through interactivity and connectivity. The idea of the Political Lamp is to hide its true nature behind a beautiful object, which immediately modifies the observer’s behavior when its purpose is revealed, causing anxiety and fascination. By definition, multiple disciplines. Often interchanged with multimedia artist (varies as to if this is a proper interchange), this area of expertise has begun to blend several disciplines together to form an altogether new field. A multidisciplinary artist has a wide knowledge-base that is deeply invested in range of materials, how those materials are used together, and the processes inherent to those materials. There’s a fairly diverse set of research backing material as well. Many contemporary artists fall into this category. This category encompasses much of the work that isn’t easily contained by the normal categories of art-making.